Our sky chart shows the Summer Triangle asterism as it appears at late evening. As seen from mid-northern latitudes, Vega – the Summer Triangle’s brightest star – shines high overhead around 10:00 p.m. daylight saving time (9:00 p.m. standard time) this evening. Altair resides to the lower left (southeast) of Vega, and Deneb lies to Vega’s left (east). 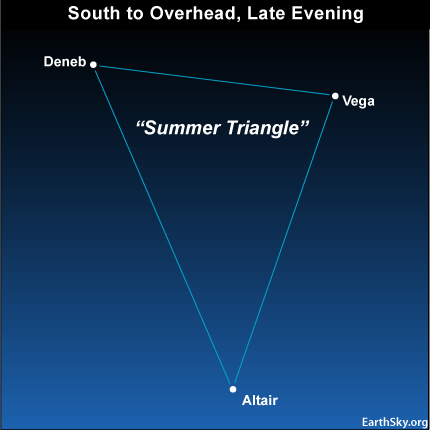 As the stars drift westward during the night, Deneb will swing upward, to replace Vega as the overhead star some two hours later, or around midnight. Of course, the stars aren’t really moving. It is the Earth’s rotation that causes the stars to move westward during the night, and the sun to go westward during the day. The three stars of the Summer Triangle shine so wonderfully brilliantly that you can see them from light-polluted cities or on a moonlit night. Yes, the sky will be drenched in moonlight tonight. Outside of our sky chart, tonight’s almost-full waxing gibbous moon beams beneath the Summer Triangle and rather close to the horizon. South of the equator, people see an “upside-down” version of tonight’s sky scene. At this hour, southern hemisphere residents will see the moon way high in the sky, Altair at the top of the Summer Triangle, and Vega and Altair sparkling at bottom.